Nashville is most famous for its music scene. Tennessee’s state capital city is a major center for recording and producing music for a variety of record labels and is also a tourist destination for country music fans. But even more jobs are available in the health care industry, and the Hospital Corporation of America and Vanderbilt University Medical Center are both large employers. Retirement in this musical city costs a median of $1,202 with a mortgage, but that drops to $419 per month without one. The median rent for people age 60 and older is $792 per month. It’s worth noting that the state of Tennessee taxes dividend and interest income, but not earned income. With a population of 1.6 million, Phoenix is the fifth most populous city in the country. The city added 32,113 people in the year ending July 1, 2016, alone, more than any other city. This sunny location is known for hot summers and mild winters. Phoenix provides plenty of nearby professional sports teams to root for, including the Cardinals, Diamondbacks, Suns and Coyotes. Phoenix has its own branch of the Mayo Clinic, one of the top-rated medical facilities in the country. Housing costs retirees a median of $1,247 per month with a mortgage, or $976 monthly for renters. Wisconsin's state capital is the home of the University of Wisconsin–Madison, where Wisconsin residents age 60 and older can audit courses for free – no homework or exams required. Senior guest auditors also get access to campus libraries and computer labs. Highly regarded health care is available through the University of Wisconsin Hospitals. But housing prices aren’t cheap in this college town. It costs retirees a median of $1,539 per month to live in a house with a mortgage. Renters pay a median of $843 per month. The state government and university are the largest employers in the area, but many businesses are also attracted to the area’s highly educated residents. There's also plenty of scenic beauty, and local lakes are popular for boating and recreation. Northern Virginia has very expensive housing, but the costs drop if you head south to Virginia’s state capital city. Retirees pay a median of $1,357 per month for a home with a mortgage. The median rent is $886 monthly. The area has several highly rated hospitals, including the Virginia Commonwealth University Medical Center. The James River races through Richmond, at times producing whitewater rapids. While some people ride and fish the raging river, others prefer strolls along the nearby trails or a relaxing lunch at a café overlooking the water. Bordered by the Connecticut River in Western Massachusetts, Springfield is about a two-hour drive from Boston and less than an hour from Hartford, Connecticut. Springfield is where the game of basketball was invented in 1891 by a physical education instructor, James Naismith, at the YMCA International Training School. The community celebrates this popular sport at the Naismith Memorial Basketball Hall of Fame. Retirees pay a median of $1,404 per month to own a home with a mortgage in Springfield, or $721 in monthly rent. Health care services are available at Baystate Medical Center. 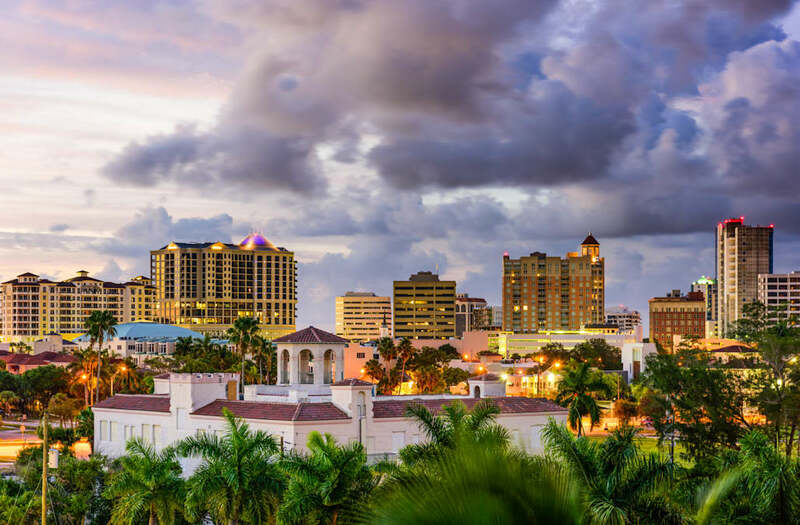 Many people are drawn to this southern Florida city on the Atlantic coast. The area added 12,715 residents between July 1, 2015, and July 1, 2016. Housing expenses are high, costing retirees a median of $1,492 per month with a mortgage and $596 with a paid-off home. Renters age 60 and older pay a median of $1,018 per month. But plenty of services are available for the cost. Retirees have a variety of health care options, including the University of Miami Hospital. And Miami-Dade residents age 65 and older are eligible to ride public transit, including the Metrorail and Metrobus, for free by applying for a Golden Passport Card. Plus, there’s no state income tax in Florida. Many retirees move to Tampa to permanently escape winter. The area generally has mild winters and hot and humid summers. Tropical storm systems can be a problem, and Tampa was significantly damaged by Hurricane Irma. Housing prices are low, costing retirees a median of $1,189 per month with a mortgage and $438 monthly for a paid-off house. The median rent for people age 60 and older is $912 per month. Health care services are available at Tampa General Hospital. The state capital of Massachusetts attracts young people to its many colleges. They often stay in town for the employment opportunities in the area, especially in the technology and financial services sectors. Boston’s many amenities and strong job market also benefit retirees. For example, Massachusetts General Hospital in Boston is ranked 4th in the nation, according to the U.S. News Best Hospitals rankings. However, finding affordable housing in Boston can be a challenge. The median home value among people age 60 and older is $397,200, and retirees with a mortgage spend a median of nearly $2,000 per month for housing. The median rent is $898 per month among retirees. Maine’s largest city is known for its nationally lauded food scene, ranging from lobster shacks and cozy pubs to exclusive seasonal tastings with top chefs and fine dining overlooking the ocean. The rocky coastline creates a dramatic backdrop as the Atlantic Ocean surf crashes into the shore. Maine residents age 65 and older might qualify for a senior citizen tuition wavier at the University of Southern Maine. A seaside retirement in this port city costs a median of $1,483 per month with a mortgage or $734 in monthly rent. There’s plenty of waterfront property to go around in Lakeland. The city is named for the area’s 38 named lakes. Many of the lakes have giant swans that are descendants of swans given to the city by Queen Elizabeth II. Lakeside living can also be affordable in Lakeland. The median home value is just $125,200, and renters age 60 and older pay a median of $770 per month. This college town is also the home of Florida Polytechnic University. The bigger cities of Tampa and Orlando are both less than an hour’s drive away. Located 90 miles from New York City and 60 miles from Philadelphia, Allentown has lower housing costs than both larger cities. Retirees pay a median of $1,395 per month for a home with a mortgage, and $610 monthly for a paid-off home. The median rent for people age 60 and older is $849 monthly. The largest employer and a major health care provider is the Lehigh Valley Health Network. Allentown works best for retirees who enjoy four distinct seasons, including snow in the winter. Honolulu is one of the highest well-being communities in the country, according to a nationwide Gallup telephone survey. But retiring on this island paradise will cost you. The median home value is $690,400. Homeowners age 60 and older with a mortgage pay a median of $2,221 per month for housing costs, but that expense drops significantly to $550 per month among retirees with paid-off homes. Retiree renters pay a median of $1,132 to live in Hawaii’s capital city. The area depends on tourism and is also a strategic spot for the military. But the cost can be worth it for the ocean views and relaxed pace of life. Some 13,455 people moved to Jacksonville between July 1, 2015, and July 1, 2016. There’s plenty to draw them in. The pleasant winters and proximity to the St. Johns River and the Atlantic Ocean offer plenty of opportunities for boating, fishing and swimming. Jacksonville has a branch of the Mayo Clinic, one of the highest-rated medical facilities in the country. Monthly housing costs for homeowners are a median of $1,247 per month, and that drops to $442 for debt-free retirees. The median monthly rent for people age 60 and older is $874. Charlotte is a hub for the banking industry, including Bank of America and Wells Fargo. But it’s also a place for fun. Sports fans can catch a Hornets or Panthers game or watch a NASCAR race. Retirees have access to health care at the Carolinas Medical Center and Novant Health Presbyterian Medical Center. Housing costs a median of $1,162 per month for homeowners and $848 for renters, but those who have paid off their homes pay just $389 monthly. Charlotte is increasing in population and the area added 15,656 people from July 2015 to July 2016. Housing is expensive in San Diego. The median home value is $517,600. Many retirees pay over $2,000 a month for homes with a mortgage, and renters are charged a median of $1,223 monthly. Only retirees with paid off homes pay a more reasonable $527 per month. Housing costs aside, people who live in San Diego generally say they enjoy a high quality of life, according to a nationwide Gallup telephone survey. Locals enjoy year-round pleasant weather, easy access to the Pacific Ocean and top medical facilities at Scripps La Jolla Hospitals and UC San Diego Health. Many children eagerly await their first trip to Walt Disney World. Retirees who no longer need to live near their jobs get the option to retire near the amusement park permanently. Homeowners age 60 and older in Orlando pay a median of $1,258 per month in housing costs, or just $452 if they don’t have a mortgage. The median rent is $961. Your grandchildren might be eager to visit you on a regular basis in this popular tourist destination. And if you decide to take on a part-time job, there’s no state income tax in Florida, which means more cash in your pocket. Philadelphia played an instrumental role during the Revolutionary War, and you can immerse yourself in American history at the city’s many museums and national historic landmarks. Check out where the founding fathers signed the Declaration of Independence or convened for the Constitutional Convention. The University of Pennsylvania was founded by Benjamin Franklin. But the city has also evolved to include more modern amenities, such as several professional sports teams, art and science museums and top-ranked medical facilities at the Hospitals of the University of Pennsylvania-Penn Presbyterian and Thomas Jefferson University Hospitals. Retirement in this historic city costs a median of $1,605 per month for homeowners with a mortgage and $953 monthly for renters. South Carolina’s oldest city was named for King Charles II of England in the 1600s. Charleston’s unique and dramatic collection of architectural styles reflects its long history. The seaside city is nearly surrounded by water, including the Ashley and Cooper Rivers and the Charleston Harbor, which provides plenty of opportunities for boating, water sports or simply taking in the water views. The city has several major hospitals, including MUSC Health-University Medical Center. The median home value is $205,100, which costs retirees a median of $1,307 per month with a mortgage. Retiree renters are charged a median of $952 per month. The research triangle is known for its high tech companies and research universities: Duke University, North Carolina State University and the University of North Carolina at Chapel Hill. The partnerships between the colleges and industry foster innovation and create a steady stream of desirable jobs. The area also has benefits for retirees, including a top-ranked medical facility, Duke University Hospital. Duke even has a retirement community near campus called The Forest at Duke. Once every four years the country’s attention turns to Iowa’s state capital city when Iowa holds the first presidential caucus in the nation. All the major candidates will come to town and listen to your concerns, and citizens get to vote in a contest that has the potential to influence the direction of the nation. The political power is one reason to retire in Des Moines. The low cost of housing is another. The median home value is $166,000. Retirees pay a median of $1,226 in mortgage payments and other housing costs, and renters are charged a median of $779 per month. Located near the Gulf Coast of Florida along the Caloosahatchee River, Fort Myers has mild winters and hot summers. Thomas Edison and Henry Ford both had winter estates in the area that are now open to the public. Retirees can spend their winters or all year in Fort Myers for a median home price of $218,400. Retirees pay a median monthly housing cost of $1,403 with a mortgage and $561 without one. The median rent is $1,077 per month. If you choose to work, there’s no state income tax in Florida. This college town is the home of the University of Arkansas, where Arkansas residents age 60 and older can enroll in for-credit courses for free and take advantage of the many concerts, sporting events and speakers. This Ozark mountain town has a free bus system, which can help retirees who can’t drive to get around town. Housing is affordable, costing retirees a median of $1,057 per month with a mortgage, and just $362 for retirees with paid-off homes. The median rent is $677 per month for people age 60 and older. Greenville is one of the fastest-growing cities in the country. The population increased by 5.8 percent between July 1, 2015, and July 1, 2016. The low housing costs make it easy to relocate there, costing retiree homeowners a median of $1,013 per month, which drops to $334 among seniors who are mortgage-free. Renters pay a median of $714 per month. The area has made a number of investments that have improved the quality of life. The city is sprinkled with public art work, Falls Park on the Reedy has the uniquely curved Liberty Bridge overlooking a waterfall and an old railroad bed has been revamped to become the 20-mile Swamp Rabbit Trail. Helping others can give you a sense of purpose during your retirement years, and there are plenty of people who need assistance in this part of Texas. Houston could take years to recover from the floods caused by Hurricane Harvey. Record-setting rainfalls have badly damaged many parts of the city, but spared others. For retirees with the time and will to volunteer, there are many people who still need help rebuilding their lives. Jobs will be created as the city reconstructs the neighborhoods that were destroyed. Other parts of Houston were left untouched, and dry parts of the city are gradually returning to business as usual. Sports fans will find a lot to love about Dallas, including the Cowboys, Mavericks, Rangers and Stars. But you don’t need to love athletics to enjoy the quality of life. Seniors qualify for discounts at many area attractions, such as the Dallas Arboretum and Botanical Garden or the George W. Bush Presidential Library and Museum. Top health care options include the UT Southwestern Medical Center and Baylor University Medical Center. Home prices are a median of $173,700. Retiree renters pay a median of $931 in monthly housing costs. While Texas doesn’t have an income tax, remember to factor in property taxes when considering housing costs. Major employers include American Airlines, AT&T and Texas Instruments. The nation’s capital isn’t an affordable place to buy a home. The median real estate cost is $408,800 and rent will cost you a median of $1,235 per month. But once you have covered your housing costs, you will gain access to a variety of amenities, some of which cost little or nothing. MedStar Health has many locations, including MedStar Georgetown University Hospital. The federal government and its contractors create a steady supply of employment opportunities. Senior citizens age 65 and older qualify for reduced fares on the metro. And a stroll along the National Mall and admission to the Smithsonian Museums and National Zoo is free. The state capital of Texas is a place for work and play. The area is a hub for tech companies including Apple, Dell and IBM. This college town is the home of the University of Texas at Austin, where seniors age 65 and older can take up to six credit hours tuition-free. The median home price of $264,700, while not cheap, is far less than in coastal cities with similar amenities. Major health care providers include Seton Medical Center Austin and St. David's Medical Center. Austinites have a propensity for live music, which is played everywhere from the traditional festivals and concert halls to restaurants and clubs. The music sounds even better when it’s enjoyed with some barbecue. Pittsburgh is a sports fan's paradise, with professional teams including the Steelers, Pirates and Penguins. The area is home to several major colleges, including Carnegie Mellon University and the University of Pittsburgh, both of which offer courses specifically for senior citizens. The UPMC Presbyterian Shadyside hospital is ranked 14th in the nation, according to the U.S. News Best Hospitals rankings. These world class amenities are paired with a surprisingly low cost of living. The median home value is $136,700. The area’s transit system helps retirees who can no longer drive to get about town. Pittsburgh retirees age 65 and older are eligible to ride the bus, the T light rail system or Monongahela Incline for free. It’s easy to be mesmerized by the Atlantic Ocean waves lapping the sand. But Daytona Beach is not a sleepy beach town. The headquarters for NASCAR, Daytona Beach hosts several large motorsports events throughout the year. Tourists and spring breakers periodically descend on the area, and many retirees decide to make this a permanent or seasonal home. Halifax Health and Florida Hospital Memorial Medical Center provide health care services. The median home value of $173,000 makes retirement on the beach a realistic possibility for retirees on a modest income. McAllen is located near the southern tip of Texas across the Rio Grande from Reynosa, Mexico. McAllen’s ultra low housing costs make it easier for retirees to pay their bills. The median home value among people age 60 and older is just $76,300. Retirees with a mortgage generally spend less than $1,000 per month on housing, and retirees with paid off homes face a median of just $347 per month in other housing costs. The median rent for retirees is also among the lowest in the country at just $447 per month. Retirees can also work without being subject to state income tax in Texas. Located in the western corner of Texas, El Paso is bordered by the Rio Grande river and is located directly across from Ciudad Juárez, Mexico. The low cost of housing in El Paso makes it easy for retirees on a limited income to stretch their budget. The median home value is $110,500. Retiree homeowners pay a median of $1,043 per month in housing costs, which drops to $376 monthly among retirees who have paid off their mortgage. Renters age 60 and older are charged a median of $566 monthly. Retirees may be able to find part-time work at the area’s many call centers. There’s a large military presence at Fort Bliss, which is the biggest employer in town. Grand Rapids is a haven for artists, including the Grand Rapids Art Museum, Urban Institute for Contemporary Arts and the Frederik Meijer Gardens and Sculpture Park. Once each year the entire city becomes a giant art gallery, where locals, visitors and art experts can all vote to determine who will win the ArtPrize and $500,000 in awards. But Grand Rapids isn’t as expensive as living in New York or Sante Fe, New Mexico. Median housing costs are $1,126 per month for homeowners with a mortgage and $726 monthly for renters. Health care service providers include Spectrum Health Butterworth Hospital and Mercy Health St. Mary's Campus. The scenic terrain and vineyards of the Texas Hill Country might draw you into the San Antonio area. But it’s the low cost of living that makes it easy to stay. There’s no state income tax in Texas. Housing is also plentiful and affordable, with the median home costing just $148,900. Health care is provided by University Hospital, Methodist Hospital and the Baptist Medical Center. Fortune 500 companies, military bases and the grocery company HEB provide many employment opportunities in the area. The San Antonio Missions, including the Alamo, became a World Heritage Site in 2015, which has brought an increase in tourists and created new jobs and volunteer positions. This former capital of Pennsylvania is steeped with history. The area’s many historic sites include Wheatland, the home of the 15th U.S. President James Buchanan, a Civil War era station on the underground railroad and several surviving buildings built during the 1700s. History buffs might be able to land a volunteer gig leading tours or helping to fund or staff the area’s many historic sites. Of course, there are also plenty of modern services, including health care at Lancaster General Hospital and a visit to the Lancaster Central Market, which claims to be the country's oldest farmers market. Lancaster is also where the marshmallow confectionery treat, Peeps, was invented. Located on Florida’s Gulf Coast south of Tampa Bay, Sarasota is recovering from Hurricane Irma. The area boasts miles of sandy beaches that draw retirees and tourists eager for relaxation and rejuvenation. But Sarasota is far from your typical beach town. The home of the Sarasota School of Architecture, you’ll find many examples of mid-century modern architecture about town. Health care is available at the Sarasota Memorial Health Care System and Doctors Hospital of Sarasota, which are also two of the area’s largest employers. The high quality of life includes an orchestra, ballet, opera and theater. Big city amenities aren’t usually affordable, but in Sarasota a home costs a median of $226,200. An added bonus: There’s no state income tax in Florida.